Surveys large choralorchestral works written between 1900 and 1972 that contain some English text. Green examines eightynine works by fortynine composers, from Elgar's Dream of Gerontius to Bernstein's Mass. 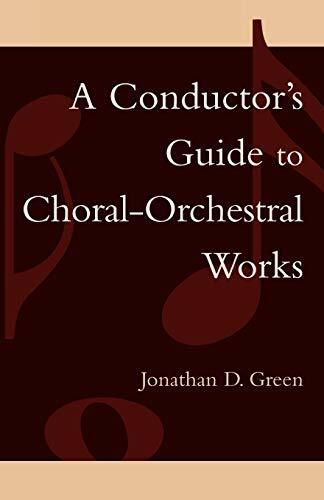 Jonathan D. Green (B.Mus., Fredonia School of Music; M.Mus., University of Massachusetts; DMA, University of North Carolina at Greensboro) is a Director of Ensembles at Sweet Briar College. He is a frequent guest conductor and clinician, and an award-winning composer. His works have been performed throughout the United States and Europe. Published by The Scarecrow Press, Inc.